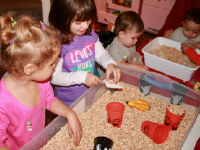 I visited Isabelle's daycare with a sensory bin filled with surprises for the children in her group. 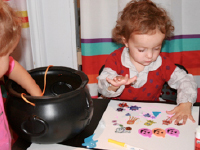 The best part: they got to use their findings for an arts & crafts activity! 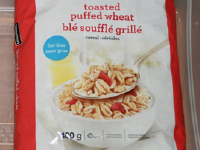 Much safer than uncooked rice and easier to clean up, puffed wheat cereal also represents a much lighter alternative and it's fun to manipulate. 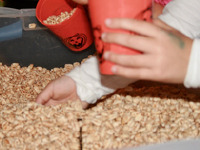 What's more, puffed wheat cereal isn't sticky to the touch, since it contains no added sugar. Because the cereal isn't easily crushed, messes are limited too. In your bin, you can hide a variety of different objects. Depending on the ages of the children in your group, you must of course pay close attention to the size of the items you use. 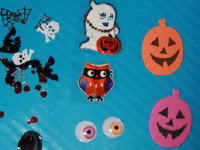 I chose to hide small arts & crafts items in my cereal bin. With toddlers, you could use large stickers. 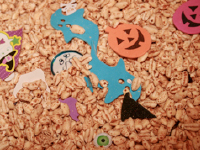 I hid large stickers, confetti, foam shapes, and wiggly eyes in the puffed wheat cereal. 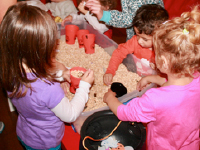 The children in Isabelle's group had a lot of fun filling and emptying containers with puffed wheat cereal. 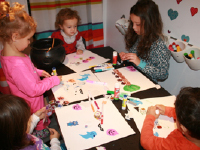 As they played, they discovered the arts & crafts items. I simply asked them to set the items in a plastic cauldron for later. While the younger children played in the next room, the older children used the items found in the cereal bin to create unique masterpieces. 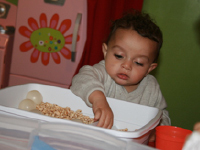 Since there were two very young children in Isabelle's group, I had prepared a second smaller cereal bin for them. 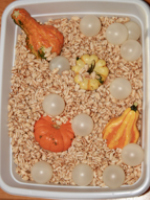 It also contained puffed wheat cereal, but I had hidden small balls and miniature decorative squash instead of arts & crafts items. 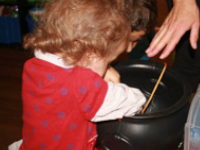 This bin was greatly appreciated by the younger children who liked manipulating and exploring the different textures. It is a good idea to give children their pacifier when they are exploring a bin like this one to discourage them from eating the cereal. Of course, constant supervision is necessary. 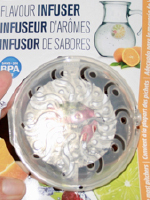 When I was preparing this bin, I also discovered a sphere designed to make flavoured water at the dollar store. It can be filled with cereal or other tiny objects. 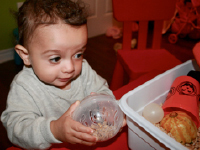 The babies were attracted to these balls and enjoyed manipulating them. 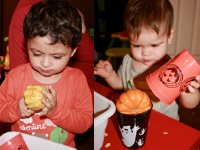 The miniature decorative squash were also a hit since they are interesting to touch and observe. Thank you to Isabelle and her group for having welcomed me into their daycare to explore my cereal bin.